Planning a wedding can be one of the most complicated and overwhelming endeavors a couple can undertake. In some cases, planning a wedding makes having children look easy. Everyone has an opinion, it is supposed to be a once in a lifetime experience and there is a lot to do. The bride needs a wedding gown. The groom and his groomsmen need tuxedos. Decorations, possibly including delicate flowers, has to be organized. Food and cake have to be chosen. Then, there are the wedding favors. There are countless options for wedding favors. The flowers in the center of a table can suffice as wedding favors, but they are not very memorable. KooziesOnline.com makes this part a breeze. We are experts at handling wedding favors. Therefore, not only are our favors amazing, but there is no hassle. The process is streamlined from the time you order until the time your favors are in your possession. KooziesOnline.com offers premium coolies and low minimums. 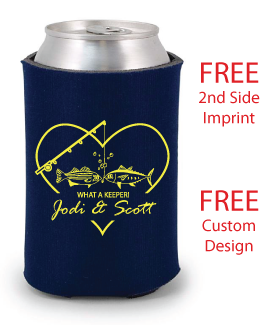 We understand that not every event calls for 100 or even 50 koozies. Our standard coolie offers an industry low of 25 pieces. You can also buy our camo koozies starting at as few as 25 pieces. Just because we offer lower minimums and lower prices does not mean that quality will be sacrificed. Each order of coolies whether it be 25 pieces of 250 pieces is checked and double checked to ensure quality control. With each order our designers will review your artwork and notes and send you a final proof for your approval. Your order can not enter production until you approve your proof. This ensures complete accuracy. Our special pricing includes all setup and shipping costs. This pricing makes sure that their are no surprises at checkout. Copyright © 2012 KooziesOnline.com. All Rights Reserved.